Bodega Pierce highlights wines made exclusively from grapes grown at our family’s estate vineyard in Willcox, AZ. The wines are designed to express the high desert terroir of the Willcox Bench that we have found to be unsurpassed in producing spectacular world class wines. We aim to provide Arizona wine drinkers with a consistent product that over-delivers on quality. Take a moment to savor the time, the place and the people around you when drinking our wines. Cheers and Salud! Join our mailing list to be notified of new releases and where to find them. 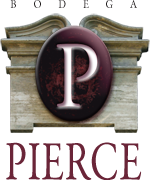 Information submitted will be used solely by Pierce Wines Arizona LLC.